Hotel ibis budget Hamburg St. Pauli Messe. Book now! Wifi! 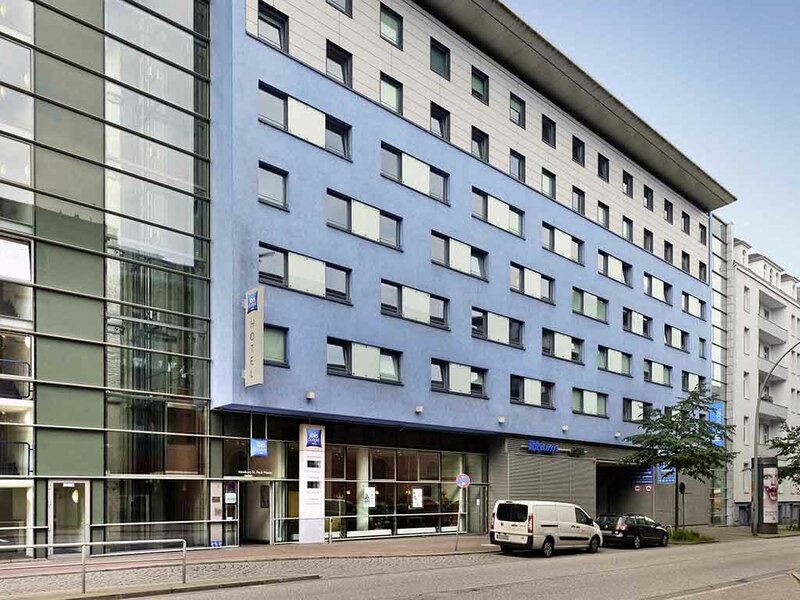 The ibis budget Hamburg St. Pauli Messe hotel is located directly in the center, close to the harbor and Reeperbahn. You can reach us via metro line U3 to St. Pauli station or by S-Bahn (city rail) to Reeperbahn station. We are also 3.1 miles (5 km) from the A7 highway. The hotel has 188 comfortable, air-conditioned rooms for up to 2 adults and 1 child under 12, and free WIFI is available. Our buffet breakfast is served each morning. 24-hour reception service. Public paying parking garage at the hotel. Comfortable beds. Nice shower. Bit weird having the sink in the same room. Fairly priced budget hotel in good location. Reasonable place for a short stay. For more than two nights, the limited furnishing (no wardrobe, not a single shelf in the room) is annoying. Hairdryer available at reception - well, I received a faulty unit. The hotel is overpriced on weekends. EUR 104 for 2 people per night without breakfast is called a budget option these days? At 8 o'clock in the morning a strange man pulled my room door and got into my room. I was extremely shocked and scared. The man said this was his room and showed me his card. Apparently he got the card from the reception. I will never come to an Accor hotel again. Great value. Clean, well equipped room, excellent breakfast in a pleasant setting, great staff, room could be a bit warmer. A printed list of TV stations would help. I regularly stay at the Ibis Budget St. Pauli and can strongly recommend it. The hotel staff are friendly and helpful, the rooms are consistently clean, and the price is great. This time I had breakfast and was pleased that the quality was also good for a low price. I stay regularly at the Ibis Budget Ibis Budget and find that it is the best deal on a hotel in Hamburg. I know what I'm going to get when I stay there. The staff are friendly, the location is convenient, the beds are comfortable. Good service, very fast and efficient! So I would like to come here again! I did travel a lot to Hamburg but first time at this hotel. Hamburg is also a city which has a lot of interesting views and for night life is also a big plus. Hair dryer was missing, breakfast room very crowded; Room was flooded by the shower, proximity to the house keeping room was annoying (they have to do their work, no doubt - but the repetitive slamming of doors in the morning and the loud conversations on the hallway were inacceptable. Discount on parking was nice, but should be promoted better.